My current obsession is warfare during the Renaissance, specifically the 16th and 17th centuries. 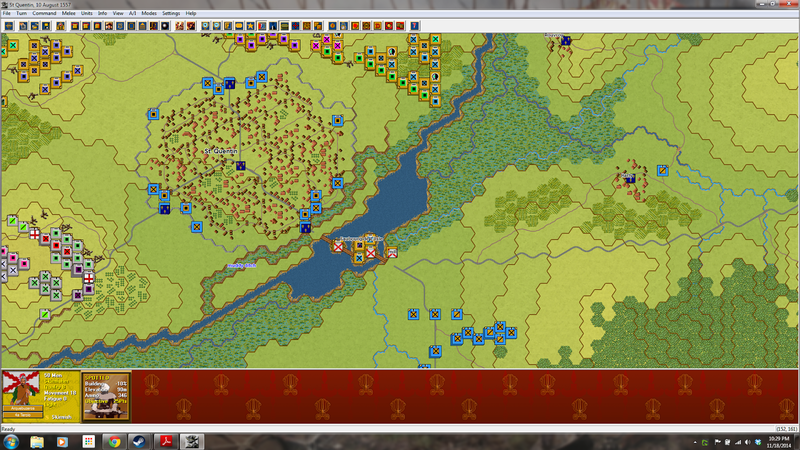 In particular I've been focused lately on the Italian Wars, though I've also been gaming some of the English-Scots battles and some of the fights in France during the first half of the 16th century. I've mentioned before my interest in the pike and shot era. Typically I've been more interested in the Thirty Years War and the English Civil War. I've recently done some reading on early Renaissance warfare though, and I'm finding it fascinating. 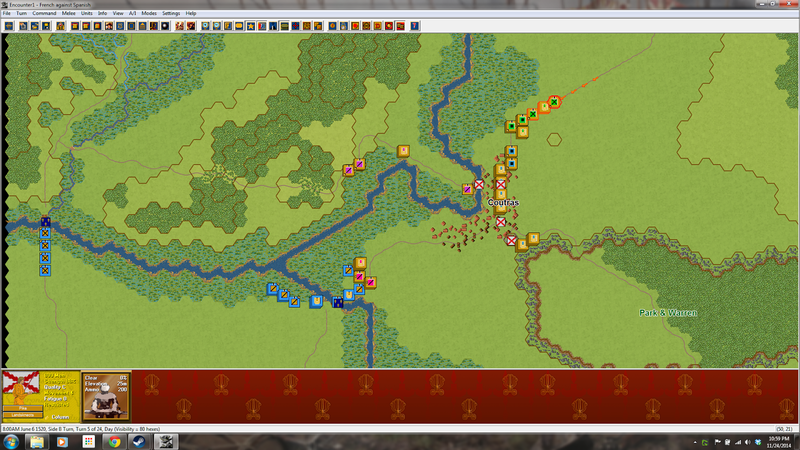 Imperial light cavalry skirmishes with the French at a river crossing while the remainder of the Imperial forces move up. From a hypothetical French vs. Imperial scenario. The changes an innovations going on in the military sciences during this period are amazing. During the Renaissance we see the change from Medieval armies to the beginnings of what we'd recognize as modern military science. What's fascinating to me is that it happens in such a short time. Charles VIII's invasion of Naples in 1494 kicked off a feverish pace of innovation in strategy, tactics, weaponry and fortifications. 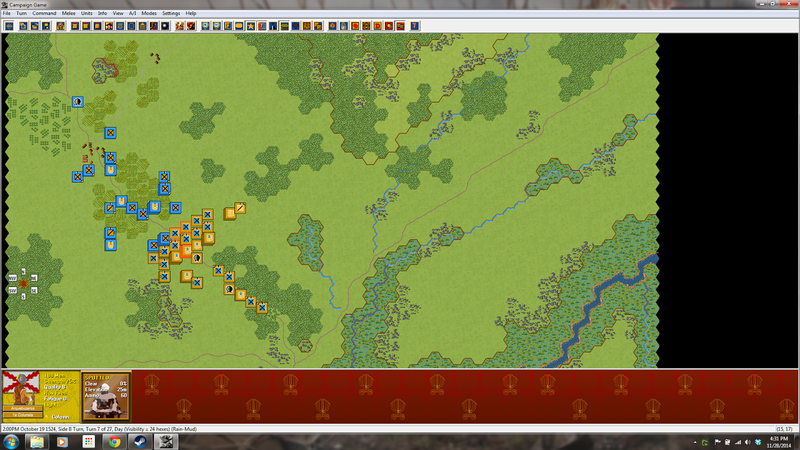 The Imperial cavalry routs but has bought enough time for the lead colunelas to form a line south of the village. Will they be enough to stop the French gendarmes? Meanwhile, a force of Imperial Dragoons takes up a position on a wooded hilltop to block any French attempt to flank from the west. Cavalry, the favored arm of all Medieval armies from the fall of Rome becomes a secondary arm. The once scorned infantry, now equipped with firearms and supported by early field artillery becomes a dominant force on the battlefield. The innovations of great captains like Gonsalvo de Cordoba and the Marquis of Pescara lay the foundations for today's armies. As with the arts and sciences, the Italian Renaissance transforms the military world. The new complexity of strategy and tactics combined with the increasing technical requirements of gunpowder weapons gives birth to the first professional armies in the West since Rome. Not surprisingly, the new professional soldiers borrow heavily from the texts left by their Greek and Roman predecessors. As happened more often than not when the French couldn't use their cavalry to their advantage, the Imperial forces win a stunning victory. An excellent overview of the period can be found in the aptly named The Renaissance at War by Thomas F. Arnold. This book nicely lays out the changes in tactics, weaponry, and organization of Renaissance armies. It also provides a nice overview of the various conflicts of the era, ranging from the Christian vs. Muslim conflicts around the Mediterranean through the various dynastic, nationalistic, and religious conflicts throughout Europe. One thing I particularly enjoyed was how Arnold manages to keep the big picture evident - lapses between the various phases of the Italian Wars make more sense when you understand that there were also internal religious conflicts going on for the various combatants as well as the ever-present conflict with the Turks. The book is also full of very informative tables, full of stuff like the weights and costs (in ducats!) of various artillery pieces, the typical wages of a Spanish army in the Netherlands in the mid-1500s, or the load-out of a typical Renaissance siege train. Combined with really nice 3D maps of various actions I find this to be a go-to reference for the period. I really enjoy gaming the wars of this era. Armies of the period make use of an interesting range of troops, from crossbowmen to arquebusiers to pike-wielding infantry, along with a dizzying range of artillery types. I'm also very interested in the differences in the characters of the national armies. 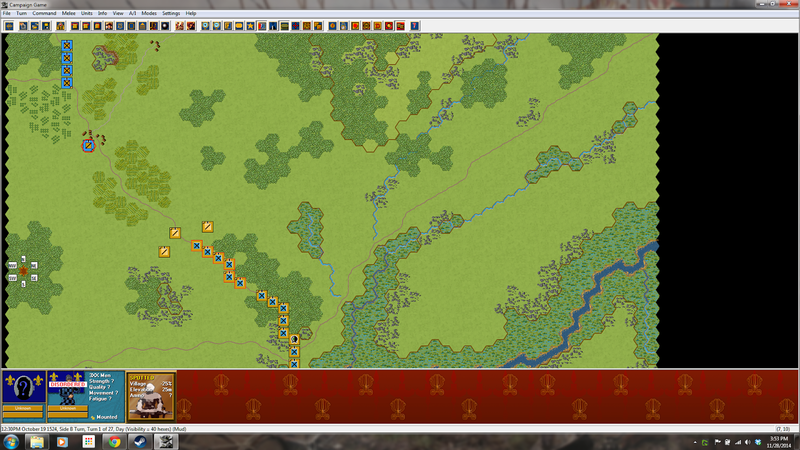 The Imperials anchor their line of infantry on some rough terrain on the left and a forest on the right. 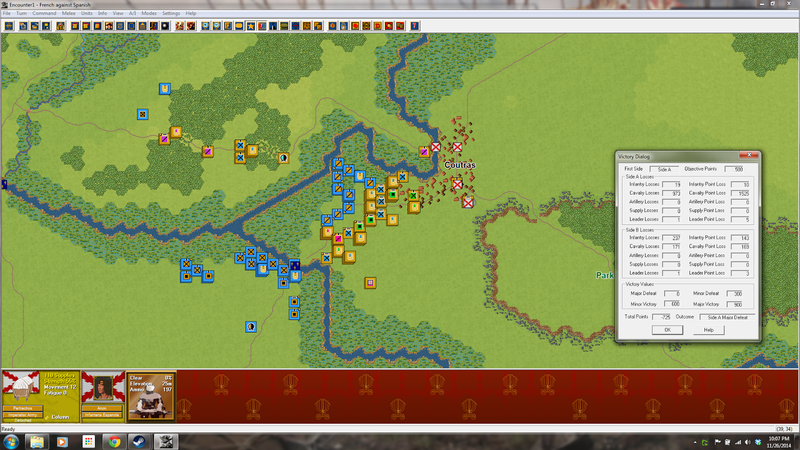 Arquebus fire and pikes will have to hold off the French gendarmes and other cavalry. The Imperial infantry is without parallel in terms of flexibility and firepower. Swiss formations are juggernauts bristling with pikes, but poor on firepower and not terribly flexible or useful against fortifications. 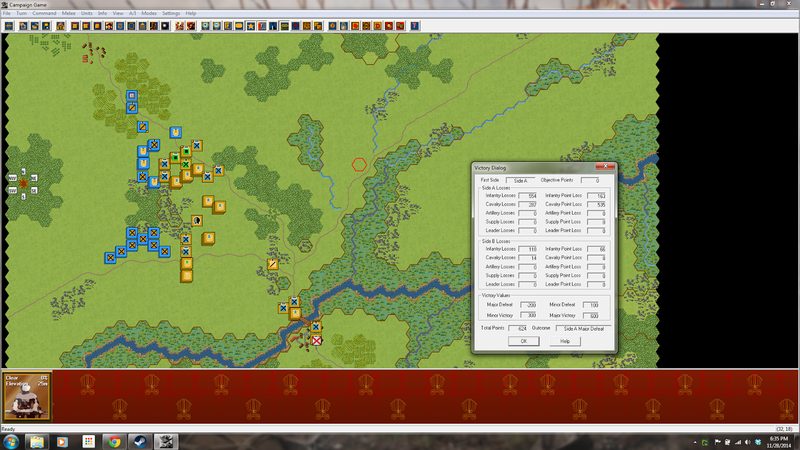 French formations are cavalry heavy and, combined with the Swiss, devastating at melee. The French try and flank with light infantry, but are stopped by the Imperial reserve and light cavalry. 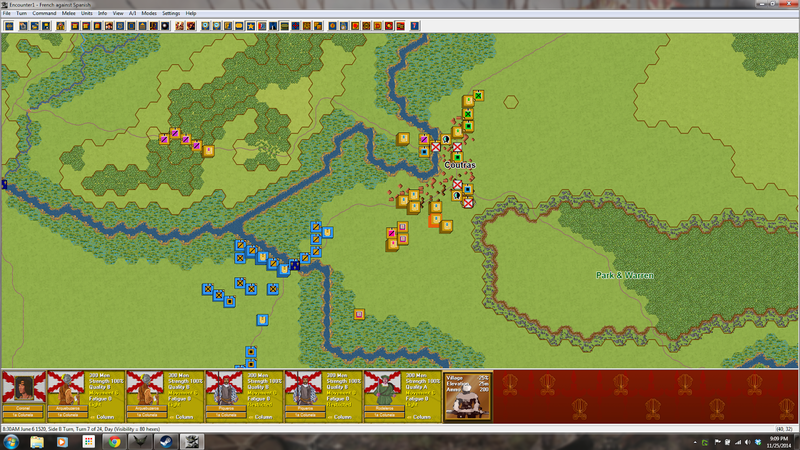 Again, arquebus and cannon fire take enough of a toll on the French cavalry to bring about a French defeat. The other book I've recently enjoyed is The Art of War in Italy by Frederick Lewis Taylor. Despite being written in the 1920's it's wonderfully readable. Frederick breaks down each arm in a separate chapter, discussing developments in cavalry, infantry and artillery. He also does a very comprehensive job discussing the changes in strategy and tactics during the period, and in tying it all back to the earlier condottieri in Italy. 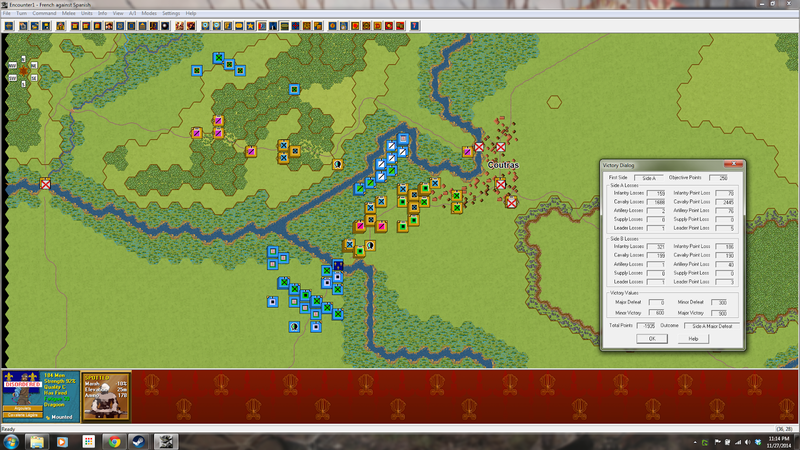 My go-to game for all of this has been Musket and Pike: Renaissance from John Tiller Software. If you're after a great computer representation of the era, I highly recommend it as the best available option today. I have some board games on the way that also cover the period. More on those when they arrive. Count me in! Great post. Just ordered the Thomas Arnold book! Looking forward to some PBEM!